Looking across the Rocky Mountain Trench at the Hart Mountains from the Cariboo Mountains. The Fraser River oxbows through the trench which divides these two mountain ranges. I made my furthest trip north for the project to explore a small corner of the Cariboo Mountains, just south of the town of Prince George, British Columbia. In these mountains and across the Rocky Mountain Trench, in the Hart Ranges, caribou numbers are fairing a bit better than further south. However, with lots of room to spread out in the summer across multiple vast mountain ranges, finding them this time of year proved to be a challenge. 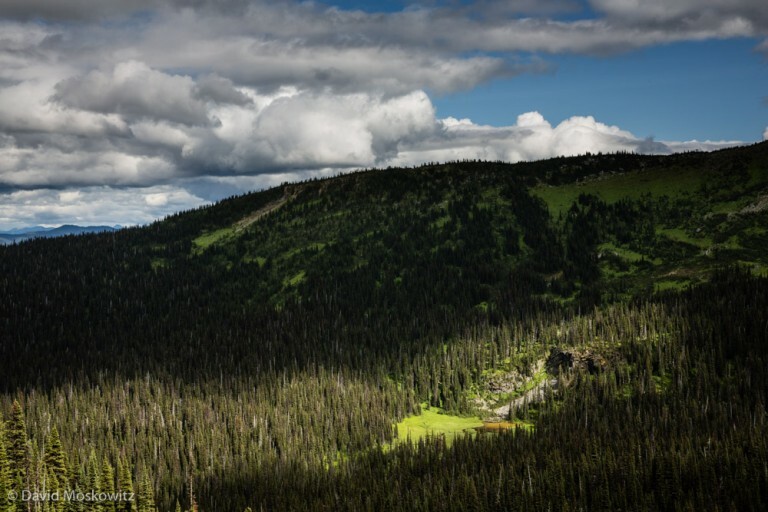 During the summer mountain caribou disperse across the subalpine forests of these mountains in order to reduce the chance of being detected by predators. This strategy apparently also works effective for avoiding curious humans as well! Treeline meadows and ponds where I searched for caribou in the area. The wet meadow system was miles from the closes road or trail. With huge amounts of inaccessible forested landscapes to spread out in, mountain caribou can seemingly disappear into these mountains. A double rainbow at sunrise precedes a violent thunderstorm that rolled across the landscape shortly afterwards. The closest I came to caribou on my excursion–some old scats found while out exploring. I stumbled upon this little black bear while walking back to my truck at the end of a long day in the field. Mount Sir Alexander, 10,745 ft (3275m) towers above the peaks around it in the Canadian Rockies, across the Rocky Mountain trench from the Cariboo Mountains.